Discussion in 'Downhill & Freeride' started by daisycutter, Mar 2, 2013. When Cannondale introduced the Jekyll Over Mountain all mountain bike way back in June 2010, they said riders werent likely to go for a one-sided fork on a 150mm bike, so they went with traditional forks from Fox. But, with the introduction of the Trigger 29er and its 130mm Lefty Super Max, they seems to have changed their mind. Cannondales marketing manager Murray Washburn told us that while the normal Lefty is plenty stiff for normal short travel (up to 120mm), a thicker, stiffer version could go up to 180mm. In reality, its more likely to end up as a 150-160mm option on the Jekyll. Washburn says they have a lot of demand for something like that in Europe, and theyre testing it right now on team rider Ben Cruzs bike. While it seems like an easy transition to modify the 130mm 29er Max, Murray says it takes some time to get the damping characteristics and spring rates right for the intended application. Cruz is riding it now in training, but hell likely start the race season on Rockshox (his sponsor) until the project is a little further along. Even so, it should end up being available at retail by the end if this year. While Cdale was mum on the subject other than to say wed be foolish if we werent looking at it, theres no reason why the Super Max wouldnt make a killer addition to a 650B trail bike, no? I love that the lefty is still around. I remember seeing one way back in 98 on a carbon raven. Ahead of their time. I learnt to service them in Canada and they are a legit fork. Had one come back once because another shop hasn't put it back together properly and the lower separated dumping the rider in a pool of oil and needle bearings! But apart from that they are a rigid amazing fork that rivals anything in its travel for performance. I love when people bag on leftys even though they've never ridden one extensively. The new ones are pretty neat and solve a lot of the silly little issues that kept older leftys from being set and forget. The PBR damper is suprisingly competent especially compared to offerings from rockshox, and the solo air that they borrow from RS is easy to tune. The forks are crazy light and significantly stiff. May not be stiffer than a 20mm tapered Fox 36, but it weighs almost a pound less? It's just a shame they cost so much and require specialized tools for disassembly. Would love to play with the internals on mine, don't want to buy a 40 dollar tool just for that reason though. I wonder if cannondale fixed the crowns on the supermax 26er though. The 29er was redesigned to offer more offset for less trail and sharper steering with 29" wheels. They'd have to fix that to make it work. I had a Lefty Max on a Prophet a few years back... super stiff and super smooth. Replacing and setting the bearings was a complete nightmare though. At least the needle bearings were dirt cheap. The one thing I really hated about it was the supposed 5" travel. At full compression, you'd bottom out on the fork boot all mashed up on itself. So really 4.5" travel or so. I love when people bag on leftys even though they've never ridden one extensively. This could be the fork that finally replaces the Maverick DUC32 that's been on the front of my XC/trail bike for 10 years. Or a Rockshox Revelation WC. The traditional designs are finally catching up. There are a couple youtube clips that show Cannondale reps putting all their body weight on a Lefty in a vise. It didn't really flex. 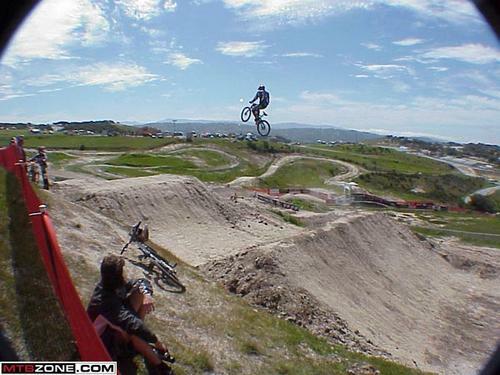 Any time the subject of Leftys come up my mind flashes back to Cedric boosting that huge gap on the 4x course at 2002 Sea Otter . . . on a Lefty. Figure if they can take that, they're tuff enuff. And then they have someone else push it into its stroke and it moves easily. Under load needle bearings are a lot smoother than bushings. In theory it's always been awesome but said bearing and boot system did have its flaws and most of the many versions of dampers and springs had a weird feel. And Cannondale always made it inconvenient to put one on a normal bike. It's bazaar that C-dale is sticking to their proprietary headset long after the Headshock that necessitated it has died. Actually, it's interesting that you bring that up. This model solves that issue by switching to a standard 1.5" head tube instead of a 1.5625" tube. Supposedly you can use a normal head tube. Actually I've heard that normal headsets fit into cannondale head tubes, so I wonder if it would work the other way around. I don't know that anybody has ever wanted to put a lefty on a big with a 1.5 head tube though. i wouldn't hold my breath on that. from what i've seen, the overall hub with is different than the 110mm for a standard 20mm hub, so the whole wheel would be offset real wonky. sure, you could redish the wheel, but who wants to do that just to swap between bikes. besides, you'd probably wind up with a hub/wheel that's "jack of all trades master of none" (assuming you could get it to work in the first place. also, regarding the boot, based on what i've seen of the new stuff it's history and they've gone to a more conventional fork gaurd like what's used on inverted forks. yeah, I hadn't thought of the dish. yeah, on the newer forks they use a conventional bushing on the lower part of the slider. That way they can use a standard seal/wiper. Above that is the roller assembly. It's much more robust this way, but my concern is that binding forces are now going to at least be partially handled by the bushing, which is counter-intuitive to what the lefty is supposed to do....roll. This fork is a supermax with longer travel, supposedly. I think there's a ton of potential, but cannondale's quirkiness will be a challenge. it's so ugly. the old ones get covered in oil and they start to attract dirt. Actually, it's interesting that you bring that up. This model solves that issue by switching to a standard 1.5" head tube instead of a 1.5625" tube. Supposedly you can use a normal head tube. Actually I've heard that normal headsets fit into cannondale head tubes, so I wonder if it would work the other way around. for quite some time now. So everybody can have a landing gear on their bike. True. I think there was more excitement because you could run standard 1.5" stems. They also increased the spacing on the clamps so you can run stem shorter than 90mm. True. I think there was more excitement because you could run standard 1.5" stems. .
Standard 1.5 stems? For all the other 1.5 forks out there? more than there are cannondale stems! I had a standard 1.5 headset put in my Prophet with no issues, then threw on a Sherman. It's nice to hear they're going to make things a little more universal. I could see myself on one of those again. As for the standard bushing down below; I'm thinking having the bearing strips up above will still keep the fork stiff enough that it will still compress nicely.